Amidst a sea of gadgets at the Consumer Electronics show, I tracked down the Toshiba folks and spent about 10 minutes with their first Chromebook effort. My initial verdict: It’s certainly a worthy Chrome OS(s goog) contender, but apart from the relatively unique 13-inch screen size, there’s little to differentiate the device from its peers. For some that may be enough. And if you’re one of those people, I think you’ll find the $279 price to be a solid value. 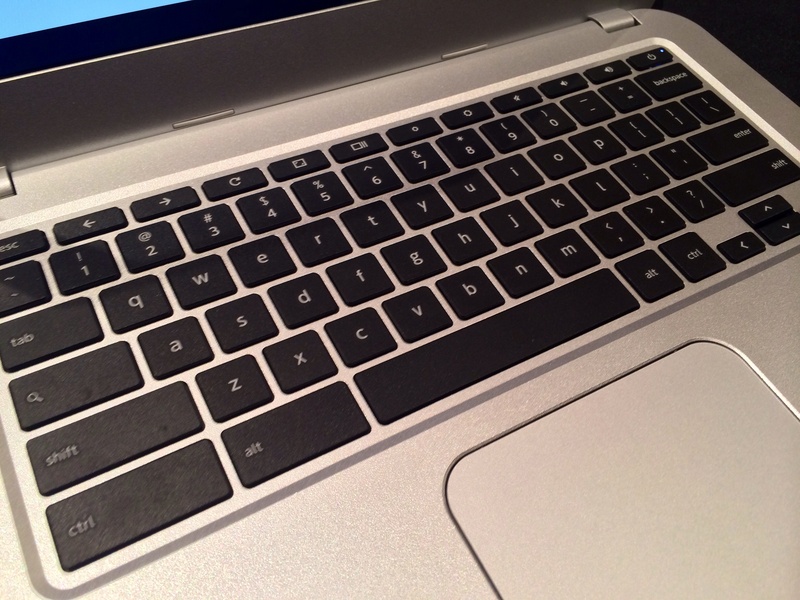 Having a larger display makes for a spacious keyboard and bigger trackpad. Typing on the Chromebook for a few minutes was a pretty good experience. The trackpad doesn’t feel as smooth as others to me, but perhaps I’m spoiled by the Chromebook Pixel and its etched glass trackpad. I didn’t run any benchmark tests, however I didn’t see any scrolling lag nor any other performance hiccups. Wi-Fi is always hit or miss at these types of events so there were some slow page loads. I attribute that to the venue and I couldn’t really test how the Chromebook works with a few dozens of tabs open. In my brief time, the device preformed as you’d expect with this now-common configuration of Haswell-based Intel(s intc) Celeron and 2 GB of memory. The internals are the same as recent Chromebooks from Acer and HP(s hpq), for example. Viewing angles on the display aren’t as good as I’ve seen from IPS panels. But they’re not terrible. And overall, I think the screen is a step up from the panel that Acer has used of late on its C720 Chromebook line. Based on that — and the added space on the keyboard, trackpad and screen — I’d be inclined to pick this up over an Acer. Build quality seemed quite good and the design is similar to Apple’s(s aapl) MacBook Air. Is this a Chromebook model that will make Chrome OS fans take notice? Probably not because the insides are the same as what everyone else is offering. If you’re looking for a little more room to work, however, the Toshiba Chromebook is a worthy option. The laptop launches on February 16, and I’m working on getting a review unit before then for a deeper dive. I have a Acer C720 2Gb of RAM is just fine for ChromeOS unless you plan of running a lot of tabs. I think the slow page loading can happen with Chromebook’s. Mine does have page loading issues intermittently. I had a Samsung with just as much problems with this. I think the WiFi issues with Chromebook’s are well publicized. I am fine with a 11.6″ Chromebook because it cannot replace my laptop with Windows. So my Chromebook is basically just a web access tool for travel and short term use. 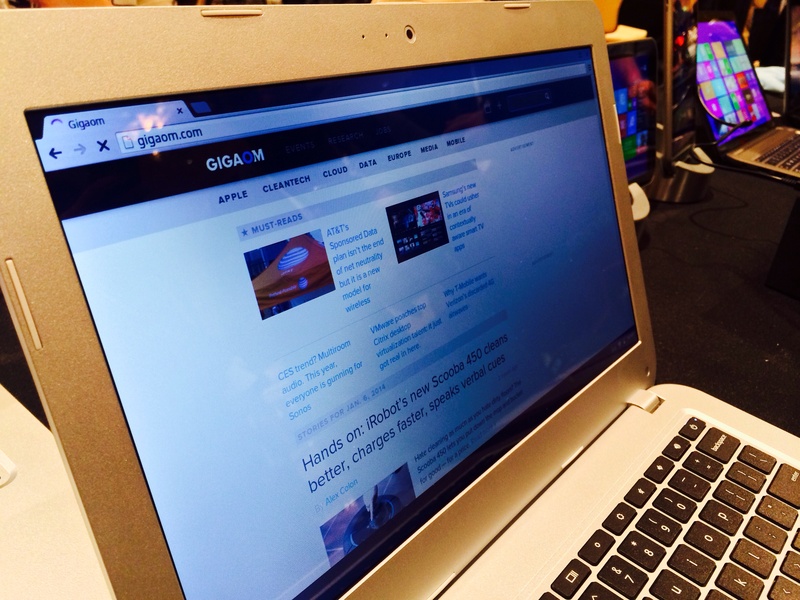 I thought the Pixel was nice, but I won’t pay $1200 for a notebook with Chrome OS on it. the haswell chips are a big improvement over the samsung xynos chip. the performance is much better and i’m not noticing the lags on the acer 720 that i had on the samsung (handed down to my sister), both with 2gb ram. i’ve had about a dozen tabs open and a youtube movie playing and nothing so far. couldn’t say the same for the samsung. also the samsung struggle mightily casting a movie. i’ve only cast one movie so far on the acer but it handled it with no hiccups. Yes, my comment agreed with you. The Hazwell is leaps and bounds above the Samsung ARM and test prove this. I had a Samsung and you could barely stream a movie and do web surfing without some glitches. For the price the Acer C720 does hold its own! Looking forward to a full review. I’m finding it harder and harder to find a Chromebook with 4GB in it from the OEM. Acer C720 is virtually non existent and I don’t know if I want to spend $349 on the HP Chromebook 14 with 4GB of RAM. Interested to know if the 2GB is sufficient for up to 10 tabs with the Haswell processor. Do you know whether Toshiba will allow an upgrade to the RAM post purchase, or is the RAM soldered to the motherboard like the C720? Chromebooks use zRam, so unless you are really rocking a lot of tabs or otherwise using a lot of memory, 2gb should suffice just fine. That’s a great question. If the RAM is upgradeable, this is a buy. The form factor is pretty cool.